My husband is a kiwi. He is also very sensitive about the origins of pavlova. When people say to him “but pavlova comes from Australia, doesn’t it?”, you can see him bristle with annoyance. The age old argument of where pavlova originates rages on, but the majority now agree that it was invented in New Zealand in honour of the ballerina Anna Pavlova on her Australian/New Zealand tour. In 2010, the Oxford English Dictionary included a new listing stating that pavlova comes from NZ, so I think the battle is won on paper – the aussies just need to let go!! 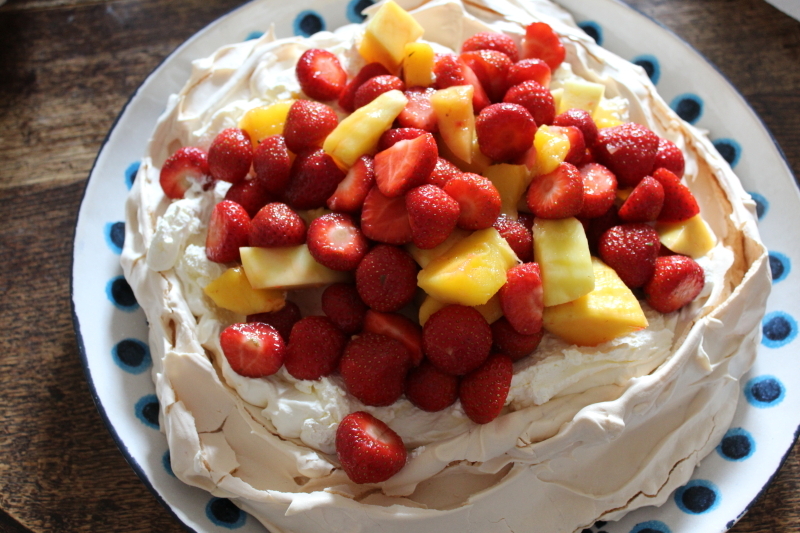 So this pavlova is for my hubby – both 100% kiwi! For my pavlova, I’ve turned to none other than the mighty Mary Berry for her recipe. You can always rely on Mary! Preheat the oven to 160°C/Fan 140°C/gas 3. Lay a sheet of non-stick baking parchment on the baking sheet. Mary suggests marking a 23cm (9in) circle on it, but I didn’t bother. Put the egg whites into a large, spotlessly clean bowl, and whisk until stiff and cloud-like. Add the sugar a teaspoonful at a time, whisking well after each addition, until all the sugar has been added. Blend the cornflour and vinegar together and whisk into the meringue mixture. Spread the meringue out to cover the circle on the non-stick baking parchment, building up the sides so they are higher than the middle. Place in the oven but immediately reduce the temperature to 150°C (or 140°C fan)/gas 2. Bake for about 1 hour until firm to the touch and a pale beige colour. Turn the oven off and allow the Pavlova to become quite cold while still in the oven. I just left it overnight in the oven in time for Saturday lunch. If you keep the oven door closed you’ll get a more marshmallowy meringue. Remove the cold Pavlova from the baking sheet and parchment and slide onto a serving plate. Top with the whipped cream and fruit, then chill in the fridge for 1 hour before serving (I didn’t bother chilling it, serving it straight away). I made this as the finale for a family bbq at the weekend and it went down a treat…. It’s such a beautiful country isn’t it and March would be a lovely time to go. 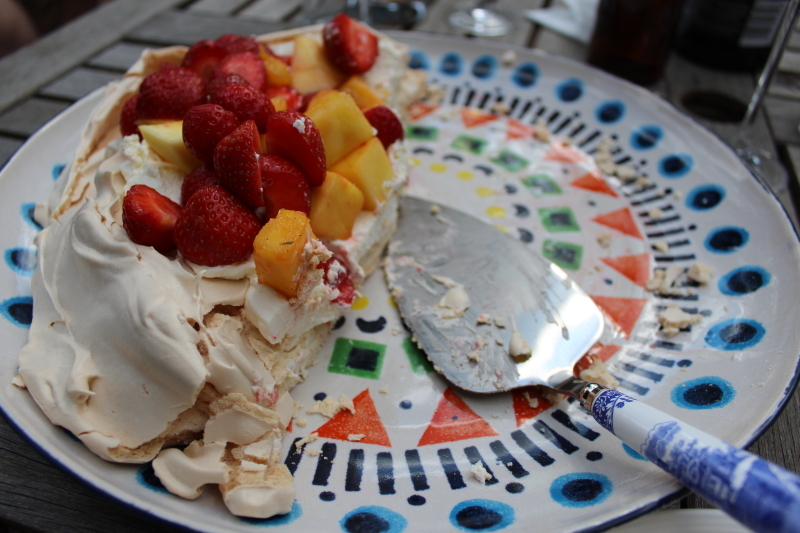 Pavlova is a great invention-I love it. A whole book on pavlova sounds amazing.